Nike brings together Real Madrid’s Portuguese striker, Cristiano Ronaldo and American Football wide receiver for the New York Giants,Odell Beckham Jr, for the launch of the Nike Mercurial football boot. The two superstars who come from two very different footballing worlds hung out in Madrid for the day and made sure they let fans know their every move. 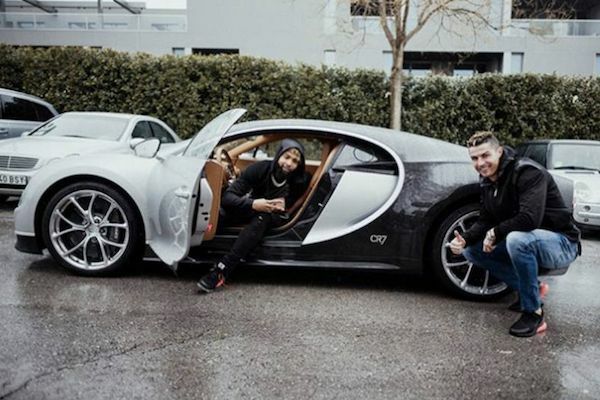 Ronaldo at one stage even managed to get his $2.7million Bugatti involved, as Odell Beckham Junior posted a video of him checking out the car before joking how it’s “disrespectful” for Ronaldo to ruin his car with the “CR7” side badges. Despite his 2017 campaign being cut short by injury, OBJ’s popularity has gone strength to strength along with his 10.2 million followers on Instagram. Ronaldo of course is one of the biggest stars in the sport world and has an Instagram following of 122 million. Ronaldo’s Bugatti Chiron is powered by an 8.0-liter W16 engine, producing 1,500 HP and 1,600 Nm (1,180 lb-ft) of torque. It can get from zero to 100 km/h (62 mph) in under 2.5 seconds, and max out at 420 km/h (260 mph). OBJ has being seen posing next to a McLaren 720S and a Lamborghini Huracan, but the only two cars he’s consistently seen in are matte black Mercedes CLS 63 AMG and a white Rolls-Royce Wraith. By comparison, Ronaldo’s car collection is huge, which is to be expected. With a yearly salary of around $39.6 million (N14.2b), he earns about 20 times than Beckham Jr. This story is TRUE but It is also a complete LIE!